Here's another good reason to pack your bags and head over to Sagada in Mt. Province. Coffee grown and roasted in the tourist town bagged one of the most coveted prizes in an international coffee competition held last month in Paris, France. Bana's Coffee which comes from Arabica coffee trees raised in the town earned a Medaille Gourmet (Gourmet Award) at the third edition of the International Contest of Coffees Roasted in their Countries of Origin. This is a contest organized by the Agency for the Valorization of Agricultural Products (AVPA). AVPA is a Paris-based non-government and non-profit association whose main objective is to contribute to the enhancement of the value of agricultural products by recognizing not only the excellence of the products but the hard work of the producers as well. Since its establishment in 2005, the organization grew its reputation by running various contests on the production of coffee, bee honey, dried fruit, and vegetable oil. The organization first introduced their coffee roasters contest on November of 2014. 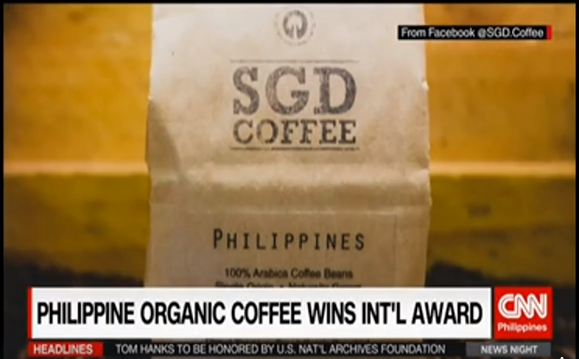 Screen-cap of a news report on the award by CNN Philippines. The award for Bana's Coffee was received by Consul Rapunzel Acop of the Philippine Embassy in Paris on behalf of Sibayan, Acop, and Watanabe. The awarding ceremony was held at the Embassy of Peru in Paris on June 28. This was the first time that the Philippines joined the competition. Other countries who sent entries to the competition include Brazil, Cameroon, Colombia, Costa Rica, El Salvador, Ethiopia, Guatemala, Honduras, Jamaica, Mexico, Nepal, Peru, Puerto Rico, Rwanda, Thailand, Togo, Tanzania, and Vietnam. If you want to have a taste of Bana's Coffee, you can go at the Bana's Cafe and Restaurant in Sagada. You can also buy packets of the roasted coffee in said restaurant.